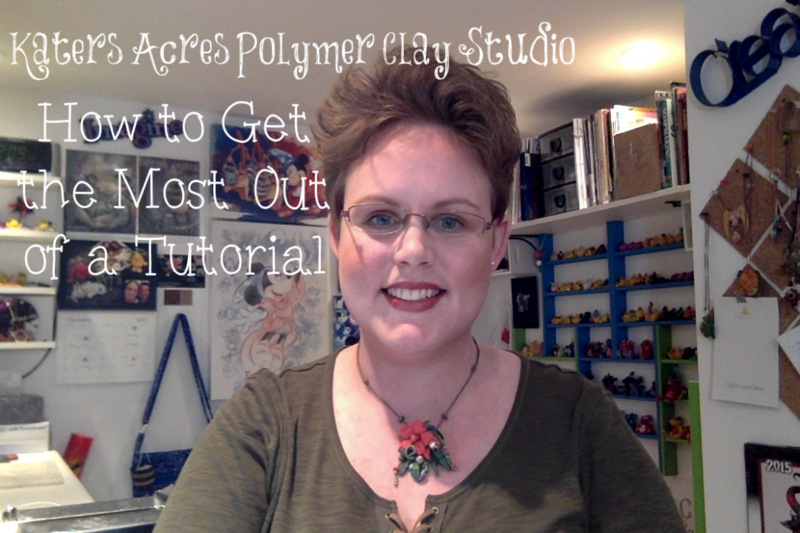 Everyone struggles with how to get the most out of your polymer clay tutorial. It’s very common that someone buys the tutorial only to do one project (the one that’s shown) and never use the concepts or techniques included to venture out on their own. Today we’re going to tack how YOU can how to get the most out of your polymer clay tutorial. I was recently in a FaceBook group where someone was talking about how they don’t “buy” tutorials, she’d rather “buy” a book or get a free tutorial. Let me first say, each of those are valid and reflect a certain percentage of the polymer clay world. I mean honestly … Who doesn’t love a great free tutorial?! Even I LOVE a good free tutorial! However, I feel the need to chime in for all of us who making a living with polymer clay and who do write tutorials. There are all kinds of polymer clay tutorials available on the internet. There’s a huge inventory of good quality ones on YouTube and about twice as many that contain wrong-advice, misinformation, and one’s that will leave you wondering why they filmed it in the first place. There are hundreds more written tutorials on blogs and websites across the world as well. And there are hundreds of high quality, well written, awesome tutorials written by professional artists and full-time polymer teachers (like me). Today, free tutorials can be found in abundance and are fantastic (I myself offer a wealth of free tutorials here on the site). However, this does NOT mean that paid tutorials are bad, not worth it, or shouldn’t be tried. 1) To illustrate or showcase a NEW technique. 2) To illustrate form or function. 3) To make a living. A delightful lady yesterday came to me with an issue she was having and unfolded to me all this wrong information she had learned about clay. The sad part was she thought it was all true and had ruined many Christmas ornaments for family & friends. I came to find out that she got it all from a YouTube video. First, not all YouTube videos are bad! However, be sure to check and try the products and techniques yourself unless they are from a reliable source (more about that later). Yes, tutorials are written to show you HOW to do a certain project, technique, etc. However, tutorials are also written to be springboards into your own ideas. In the video below, we will talk about how my most recent tutorial can be used as a springboard for something else. The people who are selling tutorials are doing so because they are advanced teachers of skill (for the most part), to make a living, to provide for their families, to showcase their love of polymer clay, and to share their skills with you. Please do NOT assume that because a tutorial is being sold that it isn’t “worth it” or “good” or “only to make money” because in most cases that isn’t true at all. Please also do NOT assume that the “cover photo” is the only thing that can be made with the specified tutorial. As I have shown in my video above, 95% of all tutorials can be adapted in some other way and used as a springboard for your own work.